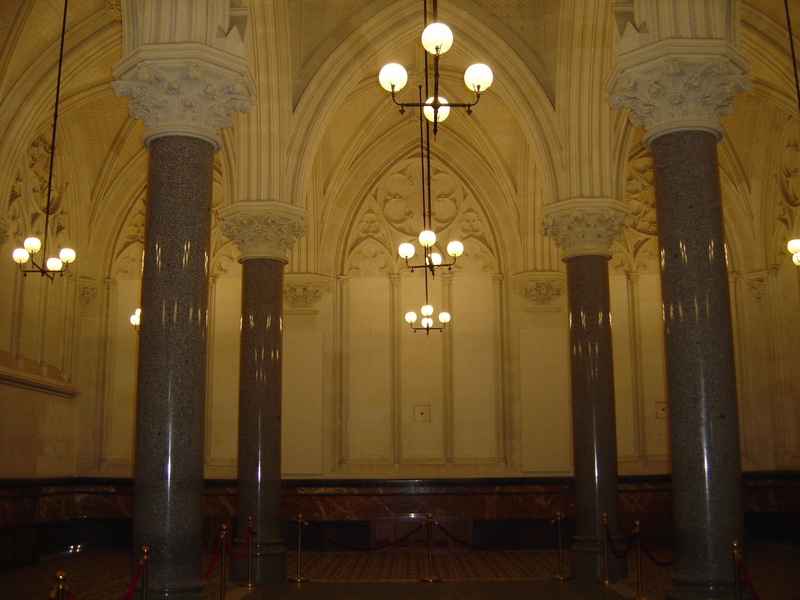 Gothic Revival is mostly found on Melbourne’s late nineteenth century churches, law courts and banks. “The Gothic Revival in Australia was a fabric of myths” write Robin Boyd in The Australian Ugliness (The Text Publishing Company, 2010, Melbourne p.61) Boyd goes on to note that: “Australia is full of Gothicky churches of crashing structural dullness struck about with decorative features.” Boyd maintained that the idea that the Gothic Revival was based on the northern European gothic tradition was a myth. Gothic Revival architecture in Australia had a great appeal as it was seen as both particularly British and patriotic, as well as Catholic because of Augustus Pugin. Pugin designed the interior of the Palace of Westminster is widely regarded as the father of Gothic Revival and was a convert to Catholicism. There are a number of Catholic churches in Sydney and Brisbane designed by Pugin who was invited to Australia by the first Bishop of New South Wales. There are many kinds of gothic revival in Australia from the decorative to the austere. The five-storey Venetian Gothic style building at 673 Bourke St that was built circa 1890 and is now known as “Donkey Wheel House”. There is the gothic revival of decorative grotesques, including an image of Jeff Kennett amongst the gargoyles of St. Patrick’s Cathedral in Melbourne or the austere gothic revival of peaked arches Coburg’s Methodist church. 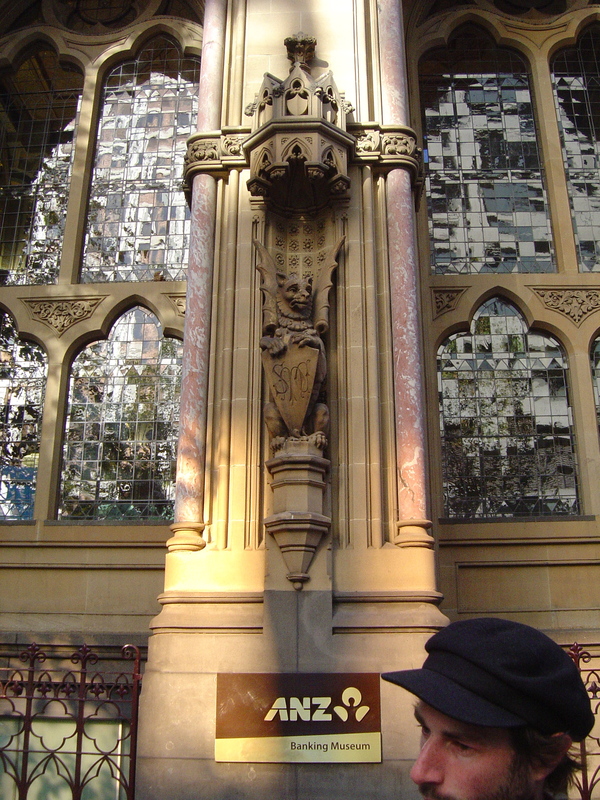 The combination of dark basalt walls and light sandstone is repeated in many of Melbourne’s older churches and cathedrals irrespective of their denomination, they all believed in the gothic revival because it referred back to their medieval heritage and created for them a hyperreal European medieval presence in a city on the other side of the planet. As well as churches and universities Gothic Revival was favoured for banks building cathedrals of commerce. The English Scottish & Australian Bank was designed the architect was William Wardell. 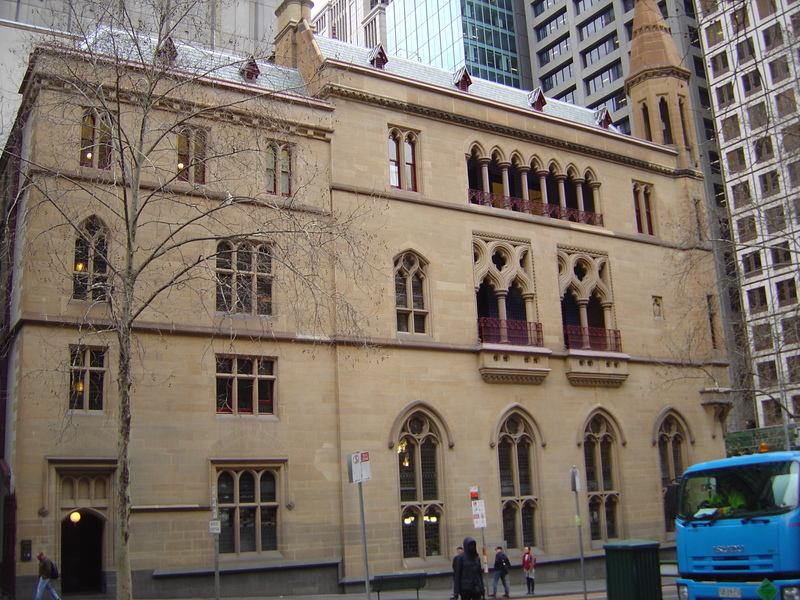 Boyd describes the English Scottish & Australian Bank as “probably the most Italian-looking thing in Australia until the expresso bars of the 1950s.” (p.62) The adjacent stock exchanged (both now the ANZ bank on Collins Street) was designed in the gothic revival by architect William Pitt and completed in 1883. It is an extravagant building both inside and out that is well worth a visit if you are in the city during business hours. The rich sculptural ornamentation of Gothic Revial buildings kept many sculptors and stonemasons employed. In 1888 the sculptor, Bertram Mackennal was commissioned for the spandrels of the Mercantile Chambers, Collins Street. However the borrowed ancient splendour of the gothic revival style did not protect the banks from the financial disaster of the Australian banking crisis of 1893 when several of the commercial banks and the Federal Bank collapsed. Gothic Revival was the main alternative to neo-classical architecture in Melbourne, alternative not as a rival but another option for architects, just as Fanta is an option to drinking Coke. All of these architectural revivals, the Gothic revival, Babylonian revival and the other architectural revivals in Melbourne’s architecture is part of a Victorian revision of history. It is as if the upper class Victorians were playing an enormous game, like a strange kind of Cosplay or the Society for Creative Anarchronism, dressing up not just themselves but their buildings in ancient fashion to play at knights. And perhaps they really were, after all Queen Victoria’s favourite portrait of Alfred depicted him wearing armour (although I’m not sure which one as there are several that do). This entry was posted on Monday, July 13th, 2015 at 1:20 PM	and tagged with ANZ Bank, architecture, Augustus Pugin, Gothic Revival, Melbourne, Robin Boyd and posted in Architecture. You can follow any responses to this entry through the RSS 2.0 feed. I love the idea of the upper classes doing a bit of cosplay with their buildings. They were doing cosplay with their buildings and dressing up. Along with Prince Albert, Toulouse Lautrec’s father was another upper class cosplayer of the nineteenth century. Australian art and architecture was identical to English art and architecture at the time; even if they were local like Bertram Mackennal, who was born in Fitzroy but studied at the Royal Academy in London and exhibited at the Paris Salon.